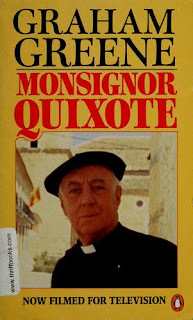 Retro Review: Graham Greene's "Monsignor Quixote"
Home » books » retro review » Retro Review: Graham Greene's "Monsignor Quixote"
I am a total sucker for second hand book shops, and few are as wonderful as Exeter Book Cycle, where shoppers can buy a maximum of three books on any one day and they set the price tag. On my most recent visit I spotted several Graham Greene novels, and having read only one of his other books (The Power and the Glory), I thought I'd pick up another. This is what led me to Monsignor Quixote. The novel is a record of Monsignor Quixote and ex-mayor Sancho's holiday in Spain, as they drink wine, eat cheese and discuss subjects as important as communism, religion and what it means to believe. Along the way they run into several scrapes which put the Monsignor in danger of losing his position in the Church. I should preface my customary ramblings by mentioning that I have not actually read Don Quixote. It, like many other well-known titles is on my 'list'. As it is, Greene's pastiche is entirely readable (and entirely enjoyable) without any prior knowledge of the book it draws inspiration from. What I liked about this book is that it's funny. Sancho and Quixote prove a perfect pair as they debate the worth of religion and politics, noting their similarities and their differences. Scenes such as Monsignor Quixote's visit to see a semi-pornographic film lead to amusing misconceptions and misunderstandings. As the novel continues, the friends become closer to one another, sharing more important intimacies about their beliefs over endless bottles of red wine. Ultimately, the story proves to be about friendship, and how it can develop between people who are apparently so incompatible to the outside observer. Greene succeeds in creating a humorous book that also captures the importance of love and understanding. A truly lovely read. Don Quixote is one of my favorite books. I thought that book 1 was hilarious (it is a comedy). This book sounds fun, I've never heard about it but now I'm going to look it up. Thanks for the link. I shall read your review and find a copy of Don Quixote soon. :) It's definitely worth a read; I think fans of Don Quixote would appreciate as a homage to the original work.